It's official! The Chamber of Commerce in Clarksville, VA is starting a new Farmers Market called "Clarksville Farm Fresh Marketplace?. Based on responses to a prior email sent to many farmers and producers in the area, we feel as though we have enough interest to move forward. This is exciting news for us, and we hope it is for you as well. - The Clarksville Farm Fresh Marketplace will take place on the 2nd and 4th Saturday of each month from 9 am -12:30 pm. - It will begin on April 27, 2019 and end on October 26, 2019. - We are currently seeking local products such as: vegetables, fruits, herbs, meat & seafood, eggs, jams & jellies, baked goods, honey, plants & flowers, nuts & seeds, cheese & milk, other agricultural products, etc. - The location will be in downtown Clarksville, VA, but the specific location depends on the number of vendors. We are strongly committed to bring fresh local products: every item you see at the market will produced by the people selling it, and it all comes from no more than 100 miles away. We are looking for local Virginia farmers and artisans. Eligible members must reside and produce items to be sold within a 100-mile radius of Clarksville. According to the Virginia Cooperative Extension reported that, Southern Virginia households spending is 15% of their weekly food budget on locally grown food products would generate $90 million in new farm income for the region.? 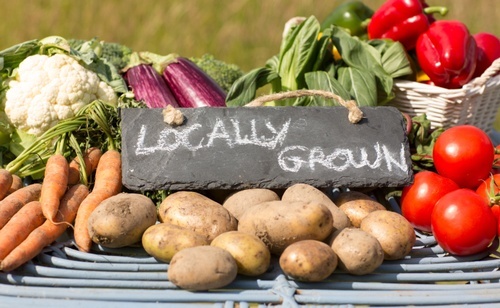 When you shop at your neighborhood farmers market, you're not only are you appeasing your taste buds, but you're giving your community an economic boost. Ever dollar counts to our local farmers & artisans.